my prize for finishing my annual accounts was to play with food dyes. i had to stock up with a load of equipment as my previous sacrificial dyepot got majorly and irreparably sacrificed to mixing mortar in my absence :(. i was really pleased that i managed to find a huuuge stockpot, four 2 1/2 pint jars and a colander for just over £20. i should probably have a rack to stand the jars on too, but as they’re oval shaped they tuck nicely against the edges of the pot so aren’t directly over the heat if it’s on low. i have a batch cooking right now. i decided to start simple and just try for 4 even colours, following the method here. i’m using some of my cheviot, divided up roughly into single ounces. they seem to fit about right into half a jar of water. 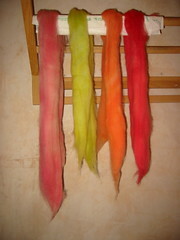 i’m trying for intense colours - red (25 drops of red), lime green (20y+6b), orange (20y+5r) and pink (9r+3b). right now the pink’s looking the least convincing, too pastelly and too purpley. oh and 1/4 cup vinegar per jar. i pre-soaked the wool in warm water with olive oil soap added and didn’t rinse, just squeezed. tried to match that temp with the dye water temp then all over a low heat, i guess until they exhaust. they’ve definitely turned out pasteller than i’d have liked. and while i don’t mind a bit of variation i’d still prefer them more even. 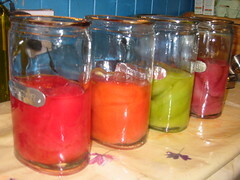 so i reckon increase the water to 2/3 jar and perhaps double the amount of dye. i’d also go for proportionally less red in the orange and more blue in the green. so this won’t do for my initial plans but the colours still work well together. will spin up and hopefully make something for dd.